Don’t be alarmed! I’m about to tell you about a worst case scenario, that legislation aims to protect us from, but this is necessary to the underlying story. Many fish contain large amounts of the amino acid (building blocks of proteins) histidine, which is a semi-essential amino acid. This means that we can produce some histidine within our bodies, but either not enough, or not under certain circumstances (like being unwell). Histidine is a perfectly natural, important component of our diets. 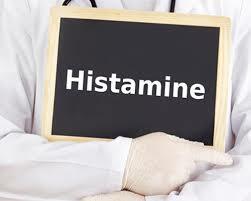 However, when the histidine-rich fish die, bacteria which live within them (once again, natural) begin to break down the histidine and convert it into histamine. Consuming large amounts of histamine is dangerous and is the cause of scombroid poisoning, which mimics an allergic reaction. This is why there is food safety legislation in place which states that levels of histamine must not go above 100 parts per million in fresh (histidine rich) fish. This prevents outbreaks of dangerous poisoning. There is, however, scombroid poisonings less-intimidating but very annoying second cousin called a rather formal ‘vasoactive amine intolerance’ which essentially translates to being intolerant to foods which have histamine. Foods that are generally accepted to have higher levels of histamine include (but are not limited to): cured meat, fresh pork, fresh or tinned tuna, anchovies, mackerel, salmon, processed fish, cheddar, brie, oranges, bananas, pineapple, strawberries, coffee, chocolate, aubergine, green tea, wine and beer. This can cause symptoms such as: diarrhoea, stomach cramps, bloating, swelling of the lips or mouth, runny nose, flushing and rashes. It’s worth noting that these symptoms are very vague and could be attributed to various conditions, so leaping to conclusions about the origins of these symptoms is not advisable. It does not necessarily mean that what you have just eaten is ‘off’ or past it’s best, just that you have a lower tolerance to that particular food. If you think you may have an intolerance to histamine, you should consult with your GP or dietician, who can rule out other conditions before making drastic changes to your diet. Winter Warmers Part 3 – Feeling Good!